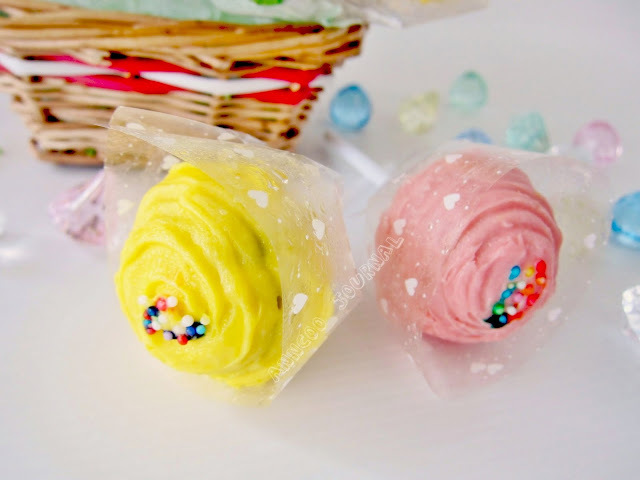 Anncoo Journal - Come for Quick and Easy Recipes: My First Cake Pops! 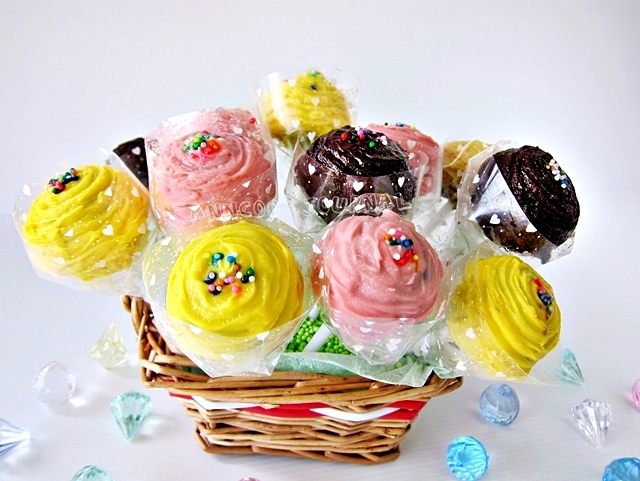 Cake Pops were invented by Bakerella and come in all sorts of cute shapes and sizes. This is my first try at Cake Pops and they are fun to make. You can even ask your kids to play along too and decorate them for any occasion like birthday, baby shower or Wedding party. The process may be time consuming but the rewards are well worth the effort. Put all the ingredients in mixing bowl except canola oil and beat high speed till thick and fluffy. Lower speed add 1 tsp vanilla extract and 1 tbsp chocolate paste, mix well and lastly add canola oil, mix well. Pour batter into a 11" (lined) cake tray and bake at preheated oven 180C for about 10 mins. Melt some semi sweet dark chocolate in a double boiler or microwave. Tear the sponge cake into pieces and put into mixing bowl, beat at medium speed until cake pieces crumbled (about few seconds). Lower speed, add in 2 tbsp melted semi sweet chocolate, 2 tbsp soft butter and 1 tbsp rum, mix well (about few seconds). Use your hand to knead the cake crumbs into a smooth dough and start rolling into small balls (makes 20) and place on a tray lined with foil. 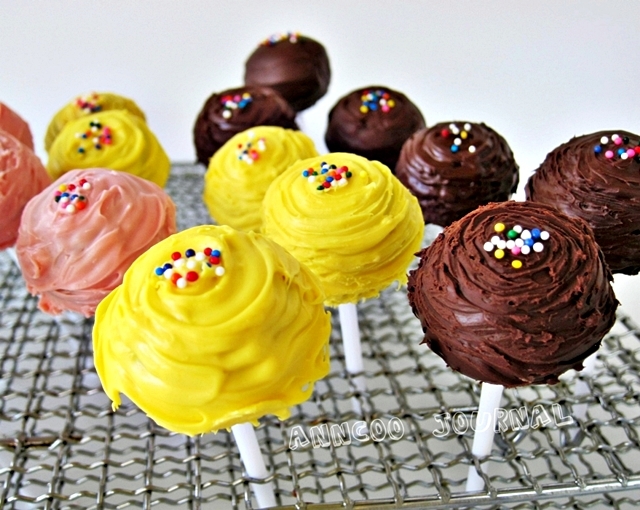 Dip the tip of your lollipop stick in a little of the melted chocolate and insert into the cake balls. Place them in the refrigerator till next day or if you want it quick, you can place them in the freezer for half hour or until you're about to dip them. I used two colors of candy melts, pink and orange and semi sweet dark chocolate. Melt the candy melts in a deep glasses or bowls that are microwavable at 30 seconds intervals, stirring in between until candy melts become smooth. 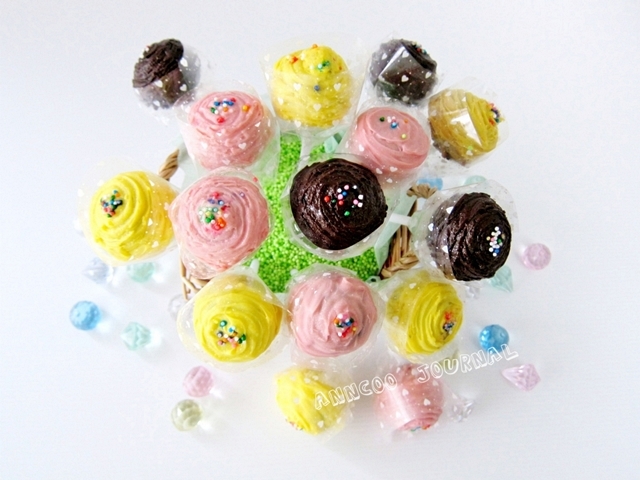 Carefully insert the cake ball into the candy/chocolate coating by holding the lolliop stick and rotating until covered. Once covered remove and softly tap and rotate until the excess chocolate falls off. Don't tap too hard or the cake will fall off, too. To make rosettes, I double coated the cake ball. The coating must be a little thick. Using a scraper and gently scrape the coating upwards about half way from the bottom of the cake ball so the excess of the coating will falls into the bowl. Then holding the lollipop stick upright or slant it slightly and again gently scrape the side of the cake ball, rotating the lollipop stick as you scrape. When it is done, decorate with sprinkles on top. You can watch Bakerella's original Cake Pop instructions here or the video below.